What is the creature in the Shazam mid-credits scene? A caterpillar is talking to Thaddeus Sivana when he is locked in his prison cell. When the younger Sivana first enters the original Shazam's cave. What is this creature and its significance in the DC universe? Mister Mind is a fictional character, a comic book supervillain created for Fawcett Comics, and now owned and published by DC Comics. 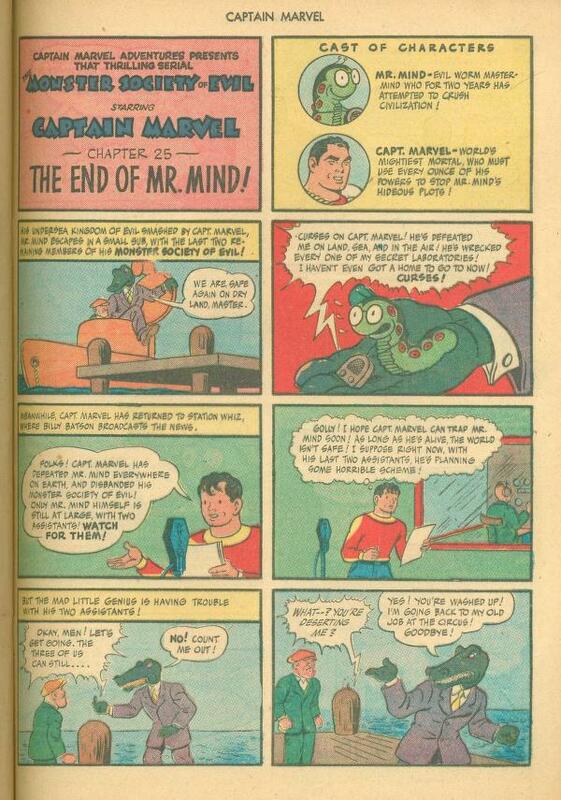 Created by Otto Binder and C. C. Beck, Mister Mind first appeared as a voice only in Captain Marvel Adventures #22; his first true appearance was in Captain Marvel Adventures #26 (August 1943). One of Captain Marvel's primary villains, Mister Mind is a two-inch alien worm of high intelligence. Mind usually carries out his villainous plans through an organization called the Monster Society of Evil, significant as one of the first supervillain teams in comics to contain villains that a superhero had fought previously; prior to this, supervillain teams were composed of villains created just for that storyline. The Monster Society made its debut in Captain Marvel Adventures #22, and the resulting "Monster Society of Evil" story arc continued for two years in Captain Marvel Adventures, ending with issue #46. This is what Mister Mind looked like, taken from the last link. Not the answer you're looking for? Browse other questions tagged dc character-identification dc-extended-universe shazam-2019 or ask your own question. Who is in the post-credits scene of the Avengers movie? Floating glove scene in Man of Steel. What does it mean? Why does Superman love Lois Lane? Is Organa in “Dark Resurrection” fan movie the original princess Leia? Was the idea of Batman inspired by vampires? Is the monster seen in the Wayne Security commercial a known DC creature? Where is the “Wonder Woman dancing” scene from? What is the Dutch Ministry of Defence thanked for in the end credits of Aquaman?